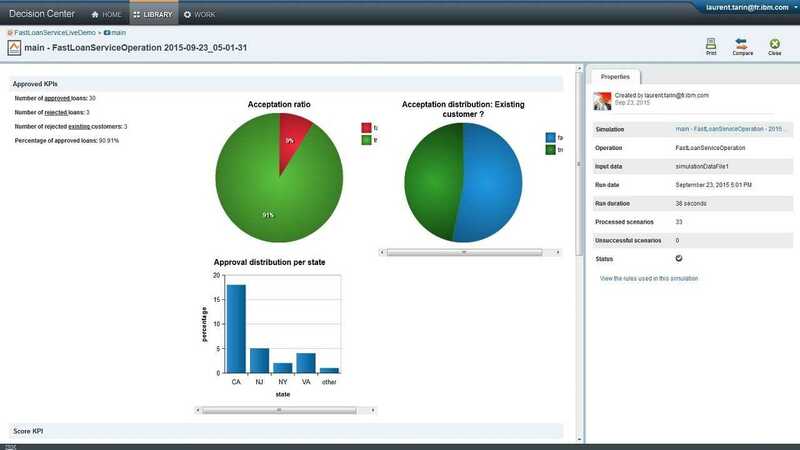 IBM Operational Decision Manager on Cloud enables you to get going quickly and easily. You can manage your updates in a secured, controlled and traceable built-in process. Update your rules and predict their impact on KPIs using the ready development, test and production environments or customize further to match your staging process - to include a user acceptance test environment or a pre-production environment. In addition to running tens of thousands of rules across many applications, IBM Operational Decision Manager on Cloud enables you to participate in authoring, deploying and managing the rules. This can add agility to your business to help you capture new opportunities. You can focus on creating content while IBM manages the IT operations of the system for you. The service allows you to invite new participants and assign roles from a simple point-and-click interface. It is available exclusively on the IBM cloud infrastructure, which is managed by IBM to help ensure security and availability. IBM Operational Decision Manager on Cloud provides governance and change management around your ability to create and scale business decisions. In addition, this service is packaged in a monthly subscription and includes tooling and runtime components for building and deploying rules-based decision services on the cloud. You can request a customized report that shows your monthly usage for decisions and managed artifacts. This report can be used to better manage compliance against entitlement. ODM on Cloud now also comes in an Express version with a lower price point suitable for smaller projects. This provides a preconfigured development environment which could be used for development, test or production and does not include high availability features. The Express offering is designed for those less complex, non-mission critical applications that has lower transaction volumes. And if your needs change or grow, it’s easy to move from Express to the full ODM on Cloud version.